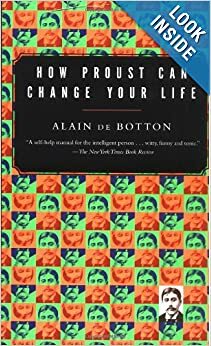 I got into Proust because of Alain de Botton’s delightful book, How Proust Can Change Your Life. This is still one of my favorite books to read, and reread, and I believe it captures the best of Proust. Where Proust is brilliant, I think, is his passionate interest in phenomenology - pages devoted to describing the process of falling, or almost falling, or just awakening from sleep, the "madeleine" experience of vivid, flashback memory that seems as if the past has temporarily re-inhabited the present moment. A novel is both a strange way to undertake an examination of the experience of consciousness more appropriate to a psychological or philosophical study, but also a particularly well-suited format, since the novel can reveal the subjective experience of its characters. Proust has an amazing gift, often reminiscent of Jane Austen, of observing the most subtle human interactions, often where one thing is said, but another is felt. And it is worth reading the 7-volumn novel, if only for his utterly unique style and minute attention to such details. 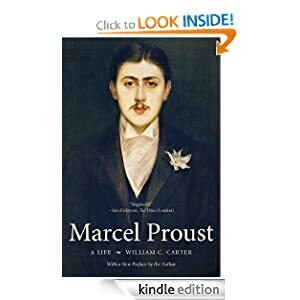 Where Proust is not brilliant - in my opinion, and I realize there is always a degree of arrogance in criticizing a great author - is in his depiction of the relationships of men and women, which forms an enormous part of the novel. When Austen makes an observation about human nature, it tends to ring true for me, but I found I frequently raised an eyebrow at Proust's: he assumes a universality to what seems to me to be a very particular, individual experience of love, if you can call it that. The novel is transparently autobiographical in many ways (and part wishfull fulfillment) in others, and at least to me, almost impossible to understand without knowing something of Proust's own life - I took a break in between Vol. 2 and 3 to read William C. Carter's biography, which I recommend highly. Proust suffered from intensely acute sensory nerves (I blame the deprivations of 1870-1 siege of Paris when Proust's mother was pregnant), and bizarrely torturous love-hate relationship with his mother, and semi-closeted homosexuality, all of which make their mark on the novel, as I read it. One of the problems with this is that Proust transposes the possessive insanity of his maternal relationship on to his romantic relationships, and then generalizes to all mankind, as well as the difficulties and conflicting emotions of homosexual relations in a time when homosexuality was not socially acceptable and mapping them on to heterosexual relations, and generalizing from it. I am not the first to find Proust's female characters (Gilberte and Albertine in particular) somewhat implausible and certainly not representative of women I know. Most of all, Proust is missing the compassion that should come with intense insight into human interactions. Austen always treats her characters, even the most egregious, with a gentle humor, but Proust's account of a similar social engagement will be scathing in its depiction of hypocrisy, and the way his characters treat each other is frequently cruel (Mme. Verdurin's "little clan" is particularly horrid) and robs the book of pleasantness it would otherwise have. It is also unclear to me, particularly in the "Albertine" section, which I found the hardest to read, how self-aware Proust is. There is an intense self-absorption in his feelings, particularly his jealousy, and the ways in which he is cruel and controlling, and I am not at all sure if this is an author (older, wiser) describing the folly of his previous self, or someone reliving (and fantasizing about) what he felt and did, or would have liked to have said and done. His insistence on possessing, controlling, spying on Albertine long after he has admittedly ceased to love or even respect her, becomes masochistic. The surprise is not that Albertine flees, but that she stays so long, but I can't tell whether Proust, the author, understands his own role in perpetuating his, and her, misery. My other criticism of Proust as an author, although this is a more difficult one to make, is that in many instances he appears to have simply plagiarized from real life, to the degree that people were recognized and recognized themselves when the books were published. Baron de Charlus is indisputably a brilliant, fascinating character, but Proust appears to have almost "lifted" him from the very real Robert de Montesquiou. Of course, Thomas Mann, and many other great novelists, have done the same thing, and one has to say they do make for characters that feel intensely "real", but there is something...distasteful about stealing someone else's private identity and working it for one's own ends. Robert de Montesquiou reportedly was not at all pleased with his depiction. Each of the volumes just about falls off a cliff: I have never had the same experience of reading the last page and being surprised not to find another. There is only the barest sense of a plot, and because of this things never feel quite finished (in fact, Proust never did completely finish rewriting and inserting new paragraphs into his work. I suspect he would have gone on doing this, regardless of how long he lived). After you read the novel, it is difficult to come away feeling "done", and so I read some of the secondary criticism available. Some, like me, find his analysis of male-female relationships dissatisfying, others seemed to feel they were right on target and spoke to the human condition. I think the best essay I read compared Proust's style to Cubism, and this gave me another window into the novel and its value. Proust will often attribute a motive to a character, or even to his narrator, but then follow it with a series of "or"s - not one or two, but four or five different, motivations, which is very strange. As a reader you want to say, "You're the author, don't you know? ", but I found I gradually became accustomed to this and even grew to appreciate his compulsively presenting the same speech or action from many different angles simultaneously: there were so many co-existing possibilities that none of them could be ruled out, even for the "I" of the narrator. And really, how certain are we that our own motives are as singular and easily identifiable as we believe? Reading a novel like In Search of Lost Time makes strong case, I think, for e-readers. If at any point I had held in my hand the physical reminder of how far I had to go, how much remained (how little had been accomplished in terms of plot), I think I would have been tempted to chuck the whole project, but one keeps hitting the "next page" button until suddenly there is no next page, and then you download the next novel, blissfully ignorant of what a long, dull slog most of it will be ahead. I say "dull" tongue-in-cheek, but the meanderings of Proust's mind, constantly revising itself, do not make for a cliff-hanger, page-turner, who-dunnit of a book. One of the things one can say as a recommendation for reading In Search of Lost Time is that it has an Everest-like quality that puts everything else in perspective. I find it easier to read other long, not-very-gripping, novels (Melville's very strange Pierre springs to mind) because of Proust. It is amazing what you can read when you let go of the need to be interested in every page - that sounds odd, no doubt, but when one ceases to expect to be enthralled at each step, one relaxes and has the liberty of reading something that may have cumulative value. If you want the "short version" (best of Proust), I recommend, first, Alain de Botton's book, which I have said, draws lessons from Proust's style and work in a fashion that is clever, light, and charming. To read Proust himself, I would recommend the first and last volumes as representative of the whole and containing the best material. There is a quite good film, Time Regained (1999) with Catherine Deneuve and John Malkovich (in French! ), among others, which deals principally with the events of the last volume. There are time and perspective shifts and symbolic elements, which make the movie initially difficult (I recall it made no sense to me the first time I saw it), but which I felt (after finishing the novel) best captured the flavor and main themes of Proust's work. I've been on a biography reading kick lately, and I find I owe an apology to Proust. I criticized him in my review of In Search of Lost Time for creating a wholly unbelievable mismash of a relationship between the Narrator and Albertine, which dominates the central volumes of the book, but I actually just ran across an almost identical description in Cary Grant's ill-fated seven month marriage to Virginia Cherrill whom he obviously had ceased to love, but whose possible, imaginary, unfaithfulness tormented him. He did, in fact, have her followed, the way Proust describes the Narrator setting spies and asking around after Albertine.